The support for solar parks is decreasing, especially in the agriculture area. Newspapers describe it as a ‘confetti of solar parks’ which displaces the agriculture and threatens to ‘flood’ the country land. But what if you use solar parks to bring back biodiversity in the dreary agricultural land? ‘Ecological sun parks’ offer the agricultural sector a chance to decrease her impact on the nature and to keep some remains of it too. But the government has to take on a steering roll for that. According to the government advisor of physical environment: “Solar panels change the outside environment into a kind of industrial landscape and nature development is blocked”. 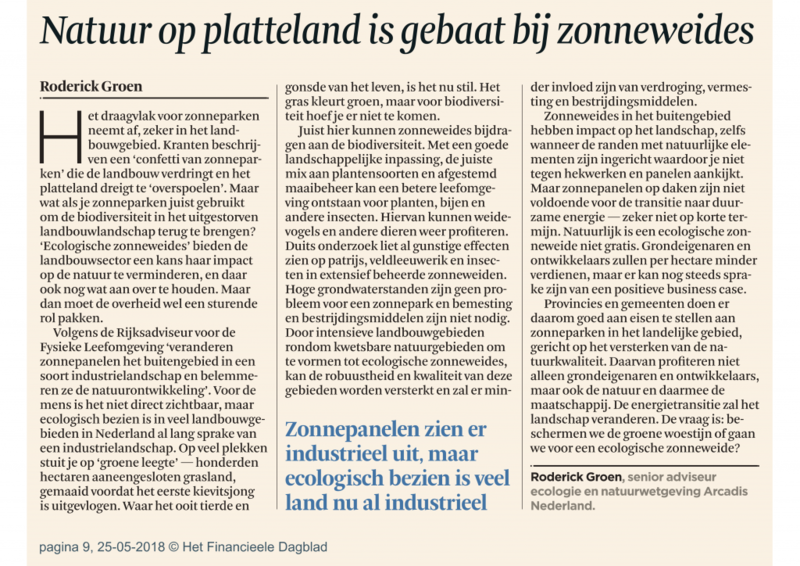 For the people it is not directly visible, but ecologically seen, the landscape areas in the Netherlands have been industrialised for a while now. On a lot of places, you will find a ‘green emptiness’ — hundreds of acres of continuous grassland, mowed before the first young bird had flown out. The grass is green, but there is no biodiversity. Especially here, solar parks can contribute to biodiversity. With a good landscape integration, the right mix of plant species and an adjusted maintenance plan, a better environment can exist for plants, bees and other insects. From this, farmland birds and other animals can profit. German research already showed beneficial effects regarding birds and insects in extensive managed solar parks. High groundwater levels are no problem for a solar park and fertilisation and pesticides are not required.By transforming intensive agricultural areas around vulnerable nature areas into ecological solar parks, the robustness and quality of these areas can be strengthened. There would be less influence of dehydration, over-fertilisation and pesticides. Solar parks in the outdoor have an impact on the landscape, even when the edges are equipped with natural elements whereby you don’t have to see fencing or panels. But solar panels on rooftops are not sufficient for the transition to renewable energy – not on a short term. Of course an ecological solar park is not for free. Landowners and developers will make less money per acre, but there can still be a question of a positive business case. Provinces and municipalities should demand on solar parks in agricultural area, aiming at the enhancement of nature quality. Thereof, not only landowners and developers profit, but also the nature and thus society. The energy transition will change the landscape. The question is: do we protect the green desert or will we choose an ecological solar park? 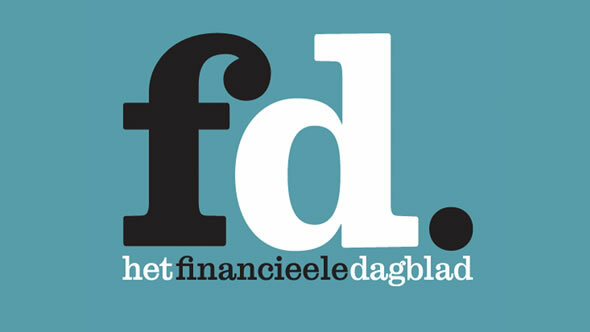 Find The original article in "het financieel dagblad"